Statistical Theory of Signal Detection, Second Edition provides an elementary introduction to the theory of statistical testing of hypotheses that is related to the detection of signals in radar and communications technology. This book presents a comprehensive survey of digital communication systems. Organized into 11 chapters, this edition begins with an overview of the theory of signal detection and the typical detection problem. 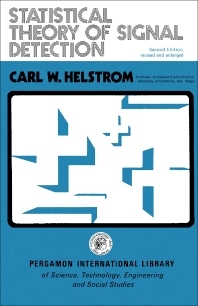 This text then examines the goals of the detection system, which are defined through an analogy with the testing of statistical hypotheses. Other chapters consider the noise fluctuations in terms of probability distributions whereby the statistical information is used to design a receiver that attains the maximum rate of successful detections in a long series of trials. This book discusses as well the criteria of success and failure in statistical situations. The final chapter deals with the types of stochastic signals. This book is a valuable resource for mathematicians and engineers.